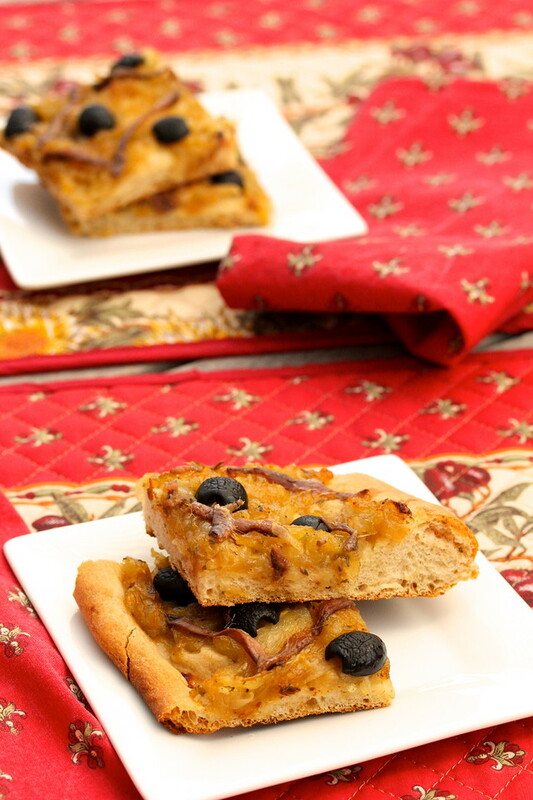 Pissaladière is a classic onion and anchovy pizza from the Provence region of France. The flatbread is a little thicker than Neapolitan pizza, and is shaped into a large rectangle. My friend David had encouraged me to try making one, and I thought this would be perfect for the Twelve Loaves August theme, which is "savory bread." Anchovies you say? Yes, anchovies. I was a little hesitant and even considered leaving them off... but I'm glad I didn't. The contrast between the sweet onions and the savory umami of the anchovies created multi-dimensional deliciousness... at least for me. My very favorite vacation I've ever taken was a trip to Provence and visiting the marchés Provence every day. My dad had rented a fabulous house in the middle of lavender fields and cherry trees in the town of Bonnieux and invited all of us to visit him there. Best vacation ever. Miss you dad. This flatbread reminds me of that trip and and my dad's culinary sensibilities. I broke out the Provencal linens I bought on that trip for these photos. For the olives, the original recipe calls for nicoise olives, but you could use any olive to suit your taste. If you'd like more anchovy flavor, you can also thinly spread anchovy paste on top of the dough prior to topping it with the onions. Adapted from Bread: A Baker's Book of Techniques and Recipes. Mix all of the ingredients until just incorporated. Cover the bowl with plastic wrap and let it sit for 12 to 16 hours at room temperature. Saute the onions and garlic in the olive oil over medium heat in a large skillet for about 30 minutes. Add the thyme, salt, and pepper. Allow the onion mixture to cool. In the bowl of a stand mixer, mix all of the dough ingredients except the olive oil and the pate fermentee on low for three minutes. Add the pate fermentee in chunks. Turn the mixer to the next highest speed, and slowly drizzle in the olive oil. Mix for 6 minutes. Place the dough into an oiled bowl or bucket and allow to rise for about 2 hours, folding the dough at the one hour mark. Preheat the oven with a stone to the highest temperature available. In my case, this was 550 degrees F.
Divide the dough in half, form each piece into a ball, cover with plastic wrap, and let rest for about 20 minutes. At this point, you can wrap and freeze half of the dough, or set it aside to bake after the first Pissaladière has baked. Stretch or roll the dough into a 12 by 16 inch rectangle. This may take some time as the dough might need some time to relax. Transfer the dough to parchment paper on top of a peel or the back of a cookie sheet. Top the dough with the onion mixture. 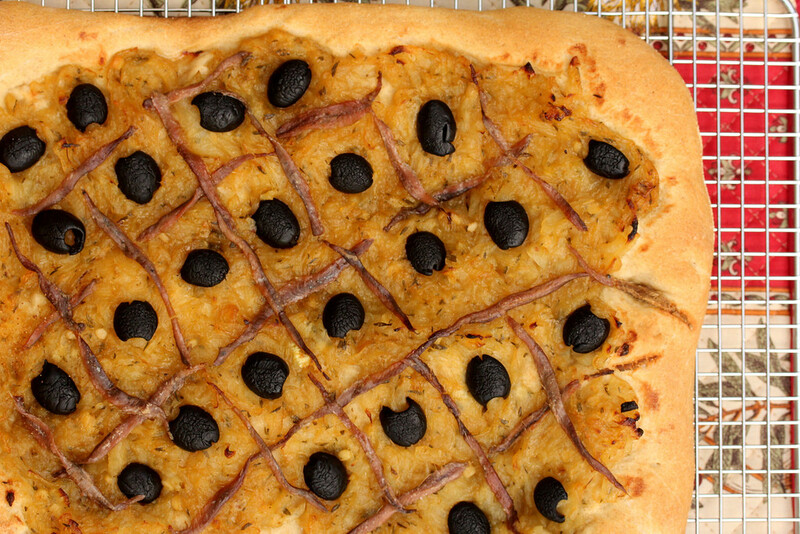 Place the anchovies into lattice pattern, and place the olives in the middle of the squares. Let the Pissaladière rest, covered, for about 20 minutes. Drag the pizza, parchment and all, onto the stone and bake for about 15 to 20 minutes, until browned. 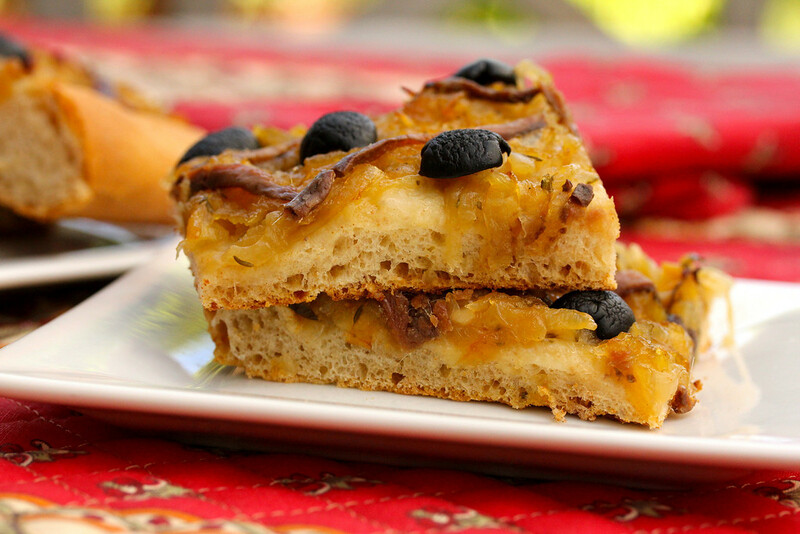 Pissaladière is an irresistible classic. I've to try your recipe. I can't wait to see what you do Liz! I'm going to check out your French Fridays version! I'll take two slices, oh wait, just give me the whole thing. Wow. Love anchovies, olives, and onions. Thanks Anne! They brought back great memories. 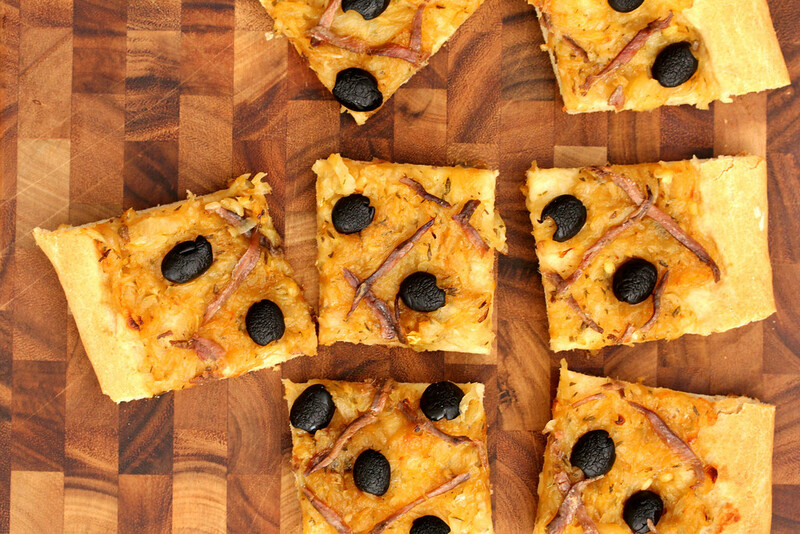 I've never thought of this combination but think the anchovies are something I'd try on this onion pizza even though I'd normally shy away from them. So pretty and it must have been a treat to eat too. I was kind of nervous about it but I loved it. What a temptation, Karen. I could eat a slice of this every day and be totally content. I always use the same recipe and now will have to try yours. Gorgeous for our August theme!